Happy first Monday of 2017 everyone! I'm so happy that it's a bank holiday - a good start to the year I think. I'm feeling a little bit sad today that the Christmas holidays are almost over, but I shouldn't really complain as I've had such a lovely long break. It's been filmed with family and food and lots of laughter, which was just what I needed and now I'm feeling ready to get cracking with the new year! On Monday we headed across to Shrewsbury for a Christmas Day round 2 with Sam's lovely family. We had such a fab day, consisting of Buck's Fizz, pressies, a big long walk, and of course turkey leftovers! We also played some really fun board games and it was just lovely to catch up with them. We drove across to Anglesey on Tuesday for a night and it was so nice to be back by the sea. 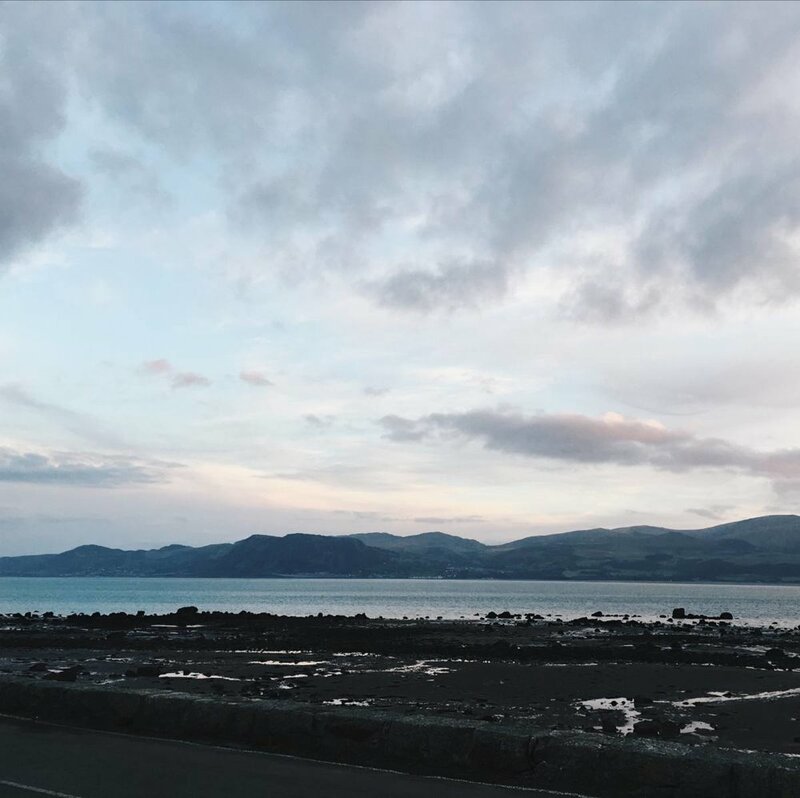 Sam grew up there and his parents have been building an amazing house right on the sea front with the most incredible views of Snowdonia and it was lovely to see how much progress they have made. Plus it made me really excited for all the time we'll get to spend there this year in the run up to the wedding. There wasn't a cloud in the sky on Tuesday evening and the lack of light pollution on Anglesey meant we had the most incredible view of the stars. We all huddled down at the bottom of the garden trying to spot various constellations - we were even lucky enough to be able to see the milky way! It was so lovely and a rare treat as you can never see the stars that brilliantly in Leeds. I've been lucky enough to spend loads of time with my favourite little people this week, from sleepovers and pancakes to cuddles and movies on the sofa. I don't get to see them nearly as much as I'd like when we're in Leeds so I've really treasured all of the quality time this Christmas. On Thursday night I was chatting to a couple of pals on Twitter about Amsterdam and how we'd all love to visit this year, and what dya know, an hour later we'd booked a trip for May! I'm so excited to return to such a beautiful city with some of my favourite internet ladies and it made me feel so grateful for all the wonderful friends and experiences this little blog has afforded me. When I saw that The Lion King was on telly this week, I couldn't resist snuggling up on the sofa and watching it from start to finish. I remember going to watch it at the cinema when I was about 6 or 7 and it always makes me feel so nostalgic - plus the songs are just pure genius, aren't they? We had a surprise delivery on Saturday morning and I was so thrilled when I realised it was a bouquet of beautiful flowers from my lovely friend Laura to wish us a happy new year. 2016 was hard on so many levels, but being surrounded by wonderful friends near and far made it so much more bearable. I'm so lucky to have such ace people in my life. My main focus over the Christmas break has been soaking in all of the goodness and quality time with our families, but after a little time away from my blog I was itching to get back! I've loved being back in the swing of writing this past few days and I'm really excited about the plans I've been working on for the next few months. After a difficult year we knew there was only one way we wanted to see the new year in, and that was with our family. We ate delicious food, had a good laugh and all hugged each other tightly as the clock changed from 2016 to 2017. They really are the best people I know and I hope that this year brings them the happiness they all deserve. We got the year off to a good start yesterday with a super lazy day on my parents sofa. We watched telly, ate my Mum's lasagne (because the diets down start until you're back at work, obvs) and I read an entire book. I'm determined to make sure that I squeeze in lots of down time this year.